Left to right: MKK Iyer, Vice President (Defence), Kalyani Group, Emmanuel de Roquefeuil, VP and Country Director India, Thales, along with Lauren Harmsworth, Deputy Director, Department of Defence, Australian Defence Export Office, and Captain Simon Bateman, RAN, Defence Adviser, Australia High Commission, New Delhi at the signing of the agreement onboard the HMAS Canberra in a call in India. Thales products such a F90 assault rifle, Hawkei and Bushmaster can be seen in the photo. The collaboration between KSSL and Thales will leverage Thales's more than 100 years' experience in the design, development and manufacture of world leading defence systems in Australia. The agreement was signed onboard the HMAS Canberra in a call in India, by MKK Iyer, Vice President (Defence), Kalyani Group and Emmanuel de Roquefeuil, VP and Country Director India, Thales. 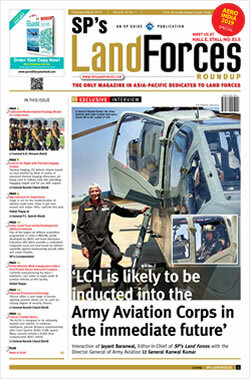 Rajinder Singh Bhatia, President & CEO (Defence & Aerospace), Kalyani Group, said, "We are very excited to enter the military weapon systems segment. This alliance will combine Thales's advance technology, knowledge and experience as an OEM with world class design, development and manufacturing capabilities of the Kalyani Group. Our cooperation aims to provide indigenously manufactured solutions for both the Indian and international markets, thereby furthering the 'Make in India' initiative of the government." 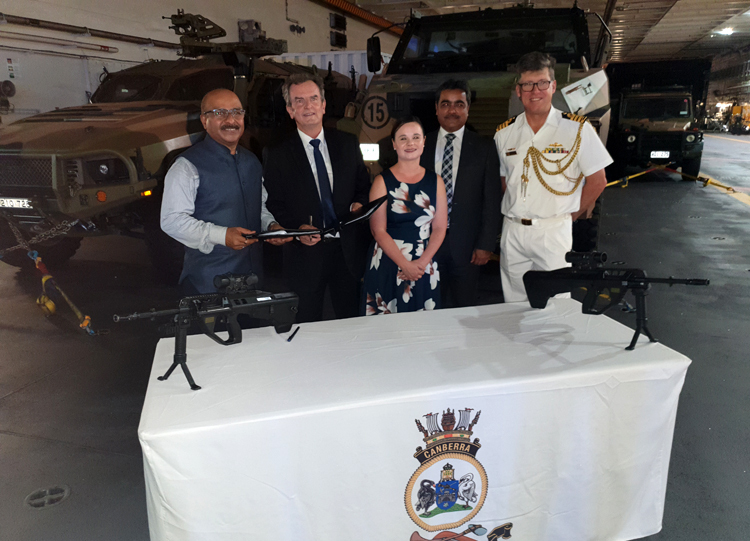 "We are very pleased to bring high-end technology from Australia and work in close collaboration with the Kalyani Group for the design and development of next generation defence systems including variants of the F90 assault rifle already in service with the Australian Defence Forces. This new collaboration will help us serve India as well as international markets. This partnership is the result of our ambition to support soldiers on operations with next generation, cutting edge technology and reaffirms our commitment to India," said Kevin Wall, VP vehicles and tactical systems, Thales.